We’ve got the equipment you need to have a fun and relaxing day on the beach! Star Beachboys beach umbrella rentals offer one of the most relaxing ways to enjoy Waikiki beach and all of its natural beauty – hang-loose under the cool shade of one of our umbrellas rentals today! And with the combo rental, you can stay sand-free lounging-out on our comfortable beach chairs. 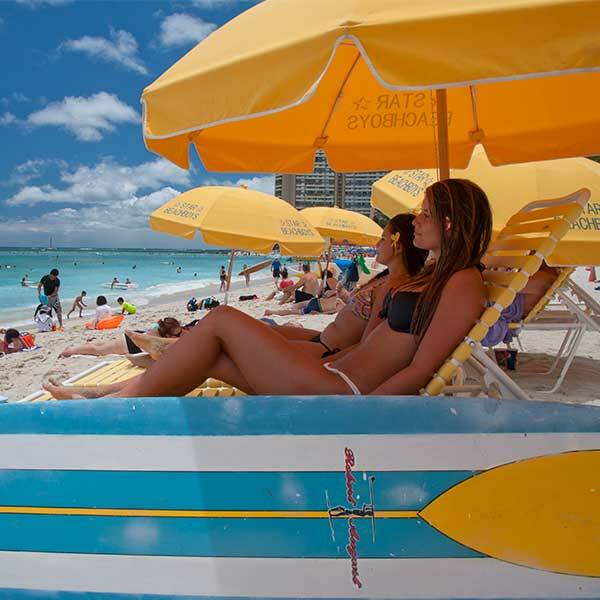 Call us and we will meet you on the beach or stop by our Waikiki Surf Shop. Our friendly beach boys are here to guide you through fun and safe Waikiki beach activities, daily from 7:00 am until 6:00 pm. You can visit us at our surf shop just across the beach or feel free to give us a call during business hours. Stay Connected with Star Beachboys!